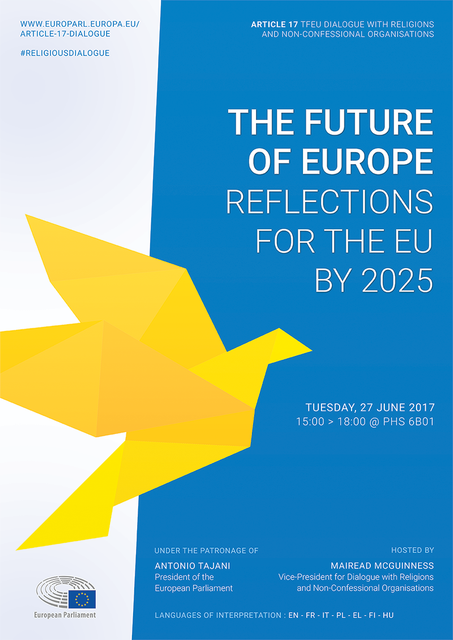 Khalid Hajji’s participation at « The Future of Europe—Reflections for the EU by 2025 »; Dialogue seminar with religious communites, under the patronage of the President of the European Parliament, Antonio Tajani. There is no doubt that Europe is going through a period of uncertainty. Despite all efforts, it seems it is not easy to boost confidence in European institutions, especially in the wake of the Brexit, the refugee crisis, and the murderous terrorist attacks. The new challenges of security and personal safety are leaving Europeans looking for an alternative: either a new Europe to help overcome the existing problems, or a totally new conceptual region, a new vision of tomorrow. While the Euro-sceptics persist in the belief that Brexit could ring the death knell of the European community, the believers in Europe cling to the hope that, together, Europeans will weather the storm and emerge stronger than before. After all, didn’t the idea of Europe take off during times of turmoil, or--as the White Paper on The Future of Europe puts it-- “with the vision of Altiero Spinelli and Ernesto Rossi, political prisoners locked up by a fascist regime on the side of Ventotene during the Second World War”? Indeed, Brexit offers an opportunity to rethink the European Union and restructure its institutions in order to atone for what Guy Verhofstadt’s report on the reform of European Union terms “the Union’s incapacity to respond effectively and quickly”. The same report hints at a displayed willingness, on the 60th anniversary of the Treaty of Rome, to proceed “to modernise the European Union and to start a Convention with the purpose of making the European Union ready for the decades ahead”. However, expressions such as “to respond effectively and quickly”, or “to modernize the European Union” cannot go unnoticed. We are entitled to ask what it means “to modernize the modern European institutions?” In this case, to modernize implies the acceleration of the pace of change to meet the challenges of the frenetic globalized world. It can also mean remodelling, remaking, updating, revamping, or whatever you like to call it, of the existing EU structures of power and decision-making. Still, whatever the pace or the shape of reform, the dream of a more united Europe cannot be revived without a spiritual refreshment running in parallel. Acceleration of change and multiplicity of designs are part of the problems incurred not only by Europeans, but by all other peoples around the globe. One of the reasons behind the widening of the divide between the EU and its citizens is, in fact, our incapacity as citizens to cope with the rapidly changing environment, which results in the incapacity to think, to make sense of our actions, let alone to plan future action. The new social media networks have accelerated what one British writer called “The End of Theory”, the consequence being an activation of a new, disorderly citizenship. In fact, empowered by the new media, the new citizen develops attitudes that almost verge on individual, exhibitionist behaviour, which makes it difficult to overcome the existing divisions and contribute to reinventing political dynamics inside Europe, let alone create a consensus on the way forward. becomes an end in itself, there is no guarantee that such a type of emancipation will not be detrimental to social integration. The European integration project, as an instance, is challenged by what seems to be a liberation of powers and agents of disintegration. By virtue of being a means of liberation, the new social media cannot necessarily reconnect communities to rebuild a European public space which can avoid relapsing into belligerent nationalism, unless an external authority silences or muzzles populist anti- Europe voices, which in itself might smack of totalitarian propaganda. This is why now, more than ever, Europe is badly in need of a soul. Even if it reeks of religious diction, the word “soul” conveys the meaning of a type of spiritual imperative to self-coercion. There is no doubt that religion can contribute to reinforcing the image of the European project as being a “sweet yoke” and call upon Europeans to humble themselves to it. In this respect, it is of vital importance that European institutions continue their constructive engagement with representatives of religions. However, it is tantamount to sowing seeds in a barren soil if behind such engagement lurks the anticipation of “Europeanising religion”, or “divinising Europe”. It would be to no avail to indulge in more questions of identity, to prove how European this or that religion is, or how religious Europe is. The attempt to define religion in terms of geography is fundamentally inconsistent with Europe’s actual need to come to terms with the challenges of globalization. The attempt at Europeanising Islam, for instance has, as a corollary, the reinforcement of inside/outside dialectics, which is a harbinger of a deep cultural crisis underlining civilisation’s incapacity to harmonize closure and openness. Basically, the insistence on reducing identity to a geographical dimension elicits the conception of ‘disposable identities’, identities that have no business in foreign cultures, in our culture, in our civilisation. On the other side, the belief that exclusive salvation is in one’s own religion tempts some representatives of each of these religions to assign a religious identity to Europe. Since the exclusive claim to salvation is common to all religions, the attempt to give Europe one religious identity is fatal to religious and cultural diversity. The question remains: how can religions contribute to giving Europe a soul if they cannot, for instance, ’Judaise’, Christianise, or Islamise it? In addition, how can Europe embark on the religious components of its new integration project without Europeanising religions? There is one way out: common action. It is not who we are, or how European we are that matters. What matters is what we do for the European integration project. It is of the utmost importance that the high-level meetings with representatives of different religions focus on setting up plans for common action, to preserve Europe as a space of equality, diversity, democracy, human rights, and to set an example to the rest of the world of peaceful coexistence between the different constituents of society.